What is the difference between "country of legal residence" and "bank account country?" Your "country of legal residence" should be the country where you legally reside. You would have a physical address there, and receive physical mail from the government, your bank, utility companies, etc. You might also pay bills and taxes at this location. Your bank account country is the country where you opened your bank account. Please keep in mind that it is possible to have a currency account at your bank different from the main currency in your country. For example, some Canadians may have opened US dollar (USD) accounts at their Canadian bank. However, they should be careful to still select "Canada" as the bank account country in these situations. Typically, the bank account country and country of legal residence will be the same. What if I'm a foreign national, exchange student, or on a visa? We definitely understand there may be nuances around your "country of legal residence." 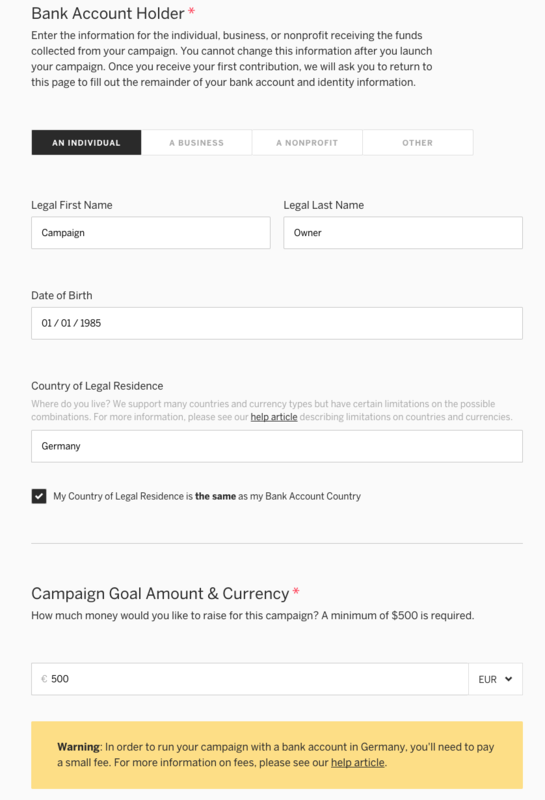 If you’re currently living in a location legally, and have a bank account there, then you can choose to select that location as your legal country. For example, you might be a French citizen currently studying at a university in the United States on a student visa. In this case, it's okay to select "United States." What if I live in a British Crown Dependency, special municipality, or other outlying territory? If you are based in a British Crown Dependency (Jersey, Guernsey, or Isle of Man), you will not be able to raise funds in Great British Pounds (GBP). You should choose USD as your currency and enter your country as United Kingdom. If you are based in any other special municipality or outlying territory, please choose USD as your campaign's currency and enter the country your territory is under as your country of residence. Should I choose individual, business, nonprofit or other? And what do I enter for my tax ID? You should choose the funds recipient that's right for your project's purpose. If you're raising funds for your business, make sure to select "business." If you're raising funds for personal purposes, such as for college tuition, you should choose "individual." "Other" is often used for something that doesn't fall into a strictly business or nonprofit category, such as a school or church. In the Tax ID/EIN field, you should enter the number given to you by your government when you registered your organization, business, etc. Please note the funds recipient and tax ID can't be changed after you go live. EUR:Stripe Payout. Find more here. Note: When you receive funds to a non-US bank account, a transfer fee is incurred for each transfer/disbursement sent by Indiegogo. Learn more. What can I change after I launch my project? Find out more about what you can and can’t edit after launching in our related article. I’m getting a warning. What does this mean? 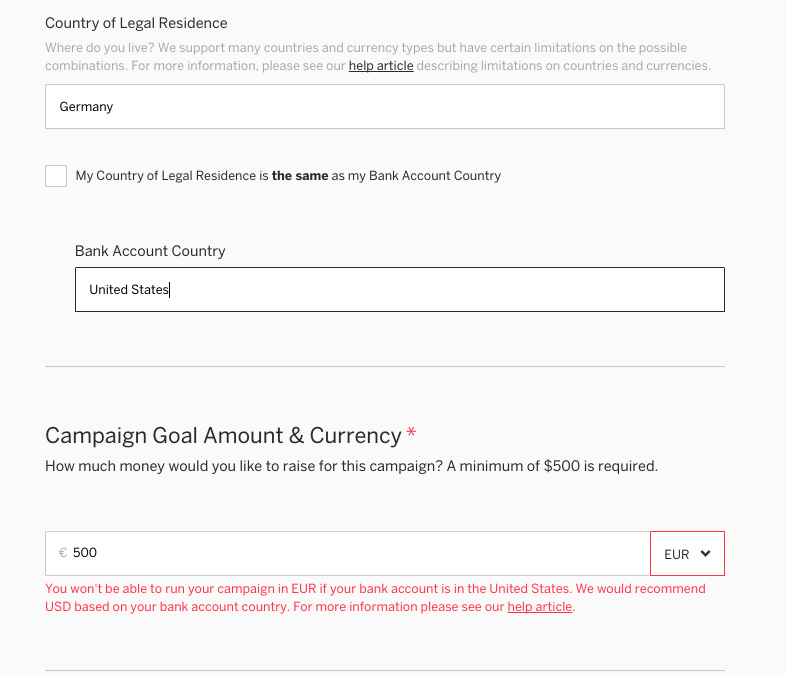 You're seeing a warning because you've chosen a currency and bank account country that we and our payment processor Stripe support, but you should be aware of how certain combinations of currency, legal residency, and bank account country will affect your campaign. This warning won't prevent you from launching your project. For more on currency selection and the warning you’re receiving, please see our related article here. Stripe, our payment processor, has certain capabilities and restrictions regarding which currencies they can send to which bank account locations. Sometimes, the currency you want might not be available in your bank's location. Typically, you’ll need to select the primary currency used in the country where your bank account is located [ex. CAD in Canada, EUR in France], or USD for any location in one of the more than 200 countries and regions supported by Indiegogo. 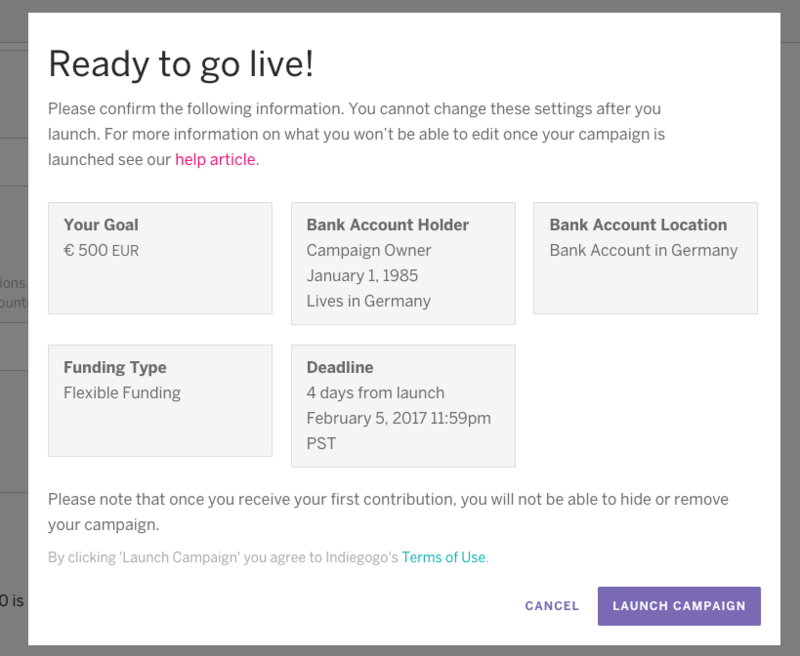 Until you clear the error on your campaign, you won’t be able to launch. For more on errors regarding your currency and bank account, please see our related Help Center Article.